The Little Humpbacked Horse. What a title for a ballet! But let's move on from that. We all like to see an underdog win. Even better if, at the end of it all, he gets a new and improved body, the hand of the princess, and the throne. A fairy tale? Sure—just like the 1830s Russian fairy tale that serves as the basis of the Mariinsky Ballet's production of Alexei Ratmansky's 2009 ballet The Little Humpbacked Horse, playing for the first time in Washington. 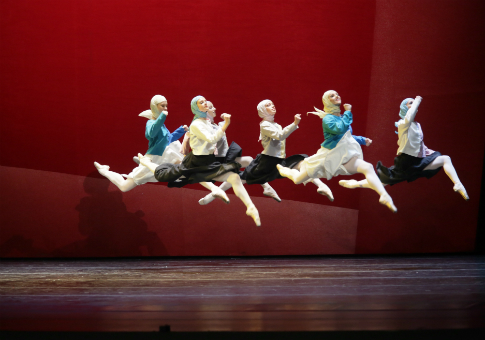 But if it's got super dancing and colorful costumes, as this version of the much-reworked ballet does—its music, by Rodion Shchedrin, dates from 1960, though the ballet was first conceived in the nineteenth century—we're likely to applaud wildly and leave with a smile on our faces. That's the case even if we're not quite sure who half the people onstage were at any given time. And that's just what the audience did opening night. Ivan the Fool, the underdog who weds the "Tsar Maiden" and himself becomes Tsar, was danced by Mariinsky's principal dancer Vladimir Shklyarov, who performs as part of a rotating cast. He was a stunner. At the beginning of Act I, Shklyarov starts awkward and shirtless. A boy beside his two manly if somewhat galumphing brothers, he grins with an aw-shucks tilt of his head. But by the end of Act II, he whips off a series of turns that show us he was just funnin' us all along about being a fool: This man really is the prince. Add to this Shklyarov's ability to hang in the air seemingly forever at the top of his jumps, and the result is magic. He can act, too, with a face as mobile as putty. We see determination, frustration, shy love for his lady love, and triumph, all served up with cockiness and boyish braggadocio. Beautiful. Shklyarov is sensational, but the role is the choreographer's loving rebuke to the patrician airs of Russian dancers, like the great if somewhat mannered Rudolf Nureyev, ballet's "it" boy of the 1960s. The Mariinsky is considered the home of patrician, perhaps somewhat cold Russian classicism, kept alive from the nineteenth century through the Soviets and brought back to modern flower. But Ratmansky is poking loving fun at all this, giving his Ivan some of the same steps Nureyev stalked through, or flung himself into, all echoes of the great prince roles ranging from Le Corsaire to Swan Lake. In this ballet we see people, not stick-figure princes and princesses. There's even a passage where Ivan tries to execute a series of fluttering beats and—though he's doing them perfectly—screws up, walks back, makes a face as though to say "okay okay bear with me, I've got this," starts the routine again, again screws up, and repeats the series until he whips off his bravado turns. "Underestimated me, did you," the dancer and role seem to ask. "Guess I showed you!" What fun. The Tsar Maiden, danced opening night by First Soloist Anastasia Matvienko, shows the same range of body and facial positions from bumbling to queenly, moving from leonine back-arched leaps to pigeon-toed confusion as she finds herself falling for this plucky boy, sent to kidnap her for the infantile but girl-crazy Tsar, who has seen her in a vision. (I told you it's complicated.) But who cares? There's no dark side to this: The sun is out all the time—both metaphorically and in the giant disc that serves as a screen for various projections, including the underwater scene with the sea people. I spent the intermission reading that synopsis, because a lot of Act I was unclear. I split my sides, and not just at the ridiculous mishmash of plot threads and the Tsar who boils to death because he thinks he too will get a studly body like Ivan, no longer the Fool. (The Tsar Maiden has made a great bod and a pretty face a precondition of marriage, and the Tsar has neither.) For example: "In the royal chambers. The Tsar's rooms. The Wet-Nurses [!] are feeding the Tsar. [Here it seems like baby food, though he has a stringy beard and they use a wooden spoon.] The Tsar is sate [!!] and falls asleep." Or this, to get ready for Act II: "The seabed. There the Sea People are leading their marine lives. [This line is my favorite—leading their marine lives! I love it.] Ivan and the Little Horse reach the seabed. Ivan looks for the ring. The ring is nowhere to be found, nowhere! What can he do he does not know! … The Sea People bring the ring to Ivan, oh yes!" Great fun, oh yes! And strangely enough, the sing-song, not-ready-for-prime-time translation from a Russian Dr. Seuss manages to give readers a pretty good sense of the rhythm of the thing—the choreography, sets, and costumes. The Tsar chews his food like a squirrel, the Gentleman of the Bedchamber moves on silent-movie tiptoes like the murderer from Paul Taylor's version of The Rite of Spring (called The Rehearsal), and the steps echo those of the Mariinsky-bred Balanchine, Nijinsky, and Nijinska. The 1950s music sounds like Prokofiev and Stravinsky, and the costumes look like something Malevich and Goncharova, artists in Russia's pre-Stalin era, would have dreamed up together. So to the trained eye it seems a good-humored pastiche of Russian modernist classics. But that's okay. All older ballets are palimpsests for other ballets. A ballet on this theme and with this title was first presented in Paris with choreography by Arthur Saint-Léon. (Some of the dances from this version have survived, though I didn't see them in Ratmansky's re-conception). Even though we now have annotation methods for dance, it's still transmitted largely from dancer to dancer. Dance lacks a "correct" text. You're free to re-do the story any way you want, using whatever bits and pieces of earlier versions you want, and nobody can accuse you of plagiarism. Dance history scholars can tell you which parts come from where. But most of us won't care. It's thoroughly enjoyable, goofy, and self-aware, not to mention an excuse for some fancy dancing. Can't we all do with more of that?